Kayak fishing is always a thrilling experience and the cost of kayaks is relatively pocket friendly. A fishing kayak does not have to cost you an arm and a leg. 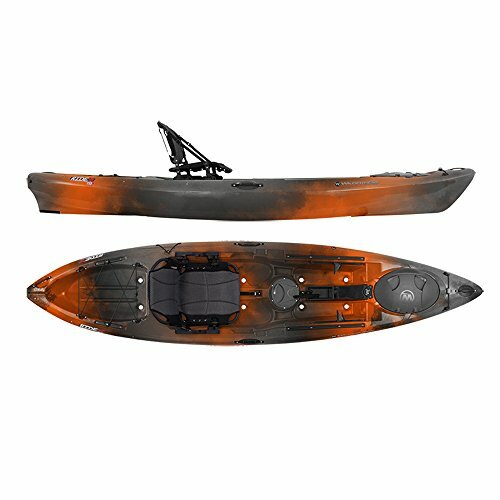 You can actually get a nice new kayak with rod holders, storage box and a tackle and even a fish-finder electronic sonar and GPS for less than $1000. However, before we get into that, I will give you a few tips to assist you get a valuable fishing kayak. First and foremost, consider the type of kayak. 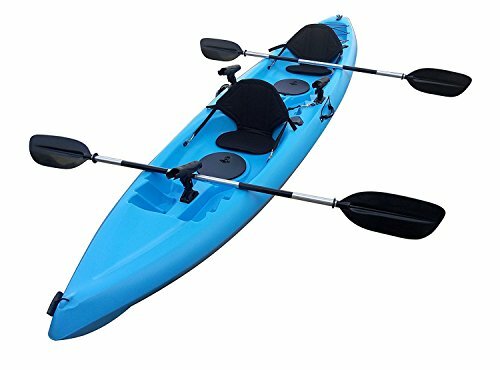 This particular type of kayak is most user friendly because it is stable and easy to get in and off, and it has no feeling of confinement in it. Sit-on-top kayaks are self-bailing; this means that water drains through tiny holes on the bottom of the kayak known as scupper holes. You would really want to get this type because it ensures that you do not swamp the kayak. Another plausible feature on sit-on-tops is that they are much easier to get back onto from water, in case you fall off. The shortcoming of sit-on-tops is that you will get wet as you paddle, while sit-inside kayaks ensure you stay dry. If you are looking for a kayak to go fishing in cooler waters, then a sit-inside kayak is the one for you, because it will keep you dry (you obviously don’t want to catch a cold). However, you should mind your paddling so that you do not flip because the kayak may actually swamp. if you are learning, try to fish close to the shore or in sheltered water so that you may swim if need be. Well after deciding whether you are getting yourself a sit-on-top or a sit-inside, the length of the kayak is another significant factor to consider. As a general rule, a long, narrow kayak if faster, whereas a short, wide kayak is slower, but more stable. If you intend to go on fly-fishing and sight casting, a short and wide kayak is a great choice because it is more stable and it will allow you to stand easily. The compromise is that the kayak is much slower and it is not ideal for paddling any real distance. On the other hand, if you intend to cover a longer distance, go for the longer, narrower kayak that cuts through the waters easily to give you a more thrilling kayaking experience. A paddle or pedal kayak? Once you have deliberated on the size and style of your kayak, there is one more key decision to make; will you buy a paddle or peddle kayak? Well, traditionally, kayaks are powered by paddles, but these days, a number of companies are offering pedal kayaks. Pedal kayaks are best for your fishing venture because they leave your hands free to allow you fish. The tradeoff of the pedal-kayak is that they are heavier and less maneuverable. The pedal system also makes it really hard to pedal in shallow water. If you decide to get a pedal kayak, ensure that you a good paddle on board as backup. With that said, let us introduce you to the 5 best fishing kayaks under $1000 available in the market today. This sit-on-top kayak is a real value for the price. The most astonishing feature on this kayak is the number of fishing rod holders. BKC UH-TK181 comes with 4 flush mount rod holders plus 3 adjustable fishing rod holders. (This is indeed a plus for this kayak, you really need as many of these things). Since this is a tandem kayak, it holds an excellent weight capacity of 450 pounds. The kayak measures 12.5 foot. However, this kayak may weigh you down a little bit, it weighs 68 pounds. Thus, you may need a helping hand to carry it into the water. For this reason, the kayak appreciatively brings with it carrying handles on the front and on the rear and also on both sides. Again, on the plus side, the kayak has ample storage for your catch. The kayak boasts of a huge basin at the rear which can be secured by the bungee cords. In addition, the kayak has 2 hatches and two paddle rests that can as well be secured by the bungee tie-down system. The kayak’s seating system is commendable, with adjustable back rest for the coveted comfort. The kayak has several foot braces for each person to choose from. The hull is not left behind, it is nicely balanced to give maximum stability while you are fishing. With that said, let us now look at the pros and cons of BKC UH-TK tandem kayak. The kayak has more than enough fishing rod holders: 7 of them- 4 flush-mounted for stability and 3 adjustable for convenience. The storage areas are enough, with storage compartments for keys, wallets etc. The kayak is a 2-person tandem, with remarkable stability, tracking and maneuverability. Some of the adjustable fishing rod holders may get into you way while paddling. If you are on budget and you want to invest wisely, this is your kayak. The Perception Pescador comes in two sizes, 10 and 12. The two sizes are both easy to handle and fast, but size”12 has better features, and is more expensive that size “10. The perception Pescador “12 comes fully equipped with the fishing kit that you need to hit the waters. Its hull design is excellent for tracking on lakes and it is highly maneuverable in rivers as well. The kayak’s construction is Rotomolded polyethylene which guarantees rugged durability. The cockpit too is a thing to go for. Comparatively, this kayak’s cockpit is a little larger, to leave you adequate room to work with your tackle and also to enter and exit without much effort. The kayak also brings along one flush mount rod holder, but you can make additions quite easily. The storage space is sorted, with a tank well with a bungee cod and a bow hatch, a center day hatch for storage of all your gear, you definitely cannot complain about space. The kayak has a passenger capacity of one adult, it weighs 60lbs and can hold a maximum weight capacity of 350lbs/ 159kg. Now, let us look at the highlighted positives and the parts we didn’t like much about Perception Pescador “12. The kayak comes with an excellent foot brace system. It may have some stability difficulties in the beginning. The FeelFree Moken 12.5 Angler is everything you thought of in a fishing kayak. This takes fishing technology to a whole new level. Made of polyethylene, this kayak is highly durable. 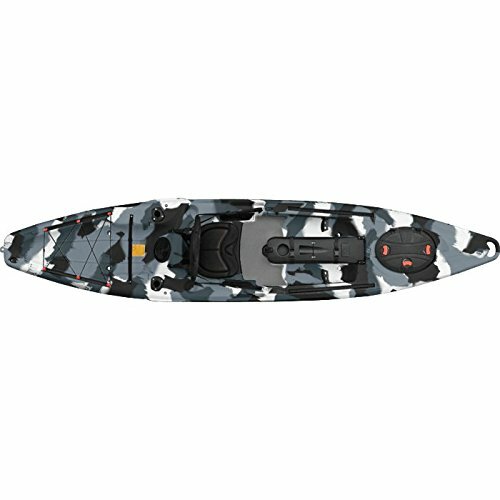 The kayak comes with a Uni-Track quick release track system that allows you to customize the kayak with all your accessories. FeelFree Moken 12.5offers one of the driest hatches on the market, the Easy seal Hatch. The kayak boast of its stability and maneuverability thanks to its Unique Wheel in the Keel. The wheel in the keel makes the kayak easy to transport without wearing you or the kayak off. The kayak also remarkably, features a standing platform to make it easy for you to stand while fishing. The kayak weighs 75lbs and it can hold a weight of up to 419lb/190.06kg. Its weight may make it a bit heavy, but this is sorted by the molded in carry handles, if there are two of you. The storage space of this kayak is just more than enough; with a storage crate and bait tank. It also has internal rod storage and a center mount flip-up console. The adjustable footrests and kingfisher seat give you extra comfort. With that said about the Moken 12.5 angler, let us highlight the standing out pros and of course the cons. The kayak has plenty of storage space, with a sizeable center console, side pockets, and the rear tank well and the front oval hatch and a day hatch. If you want to customize the kayak with a rudder, you have to purchase it separately. This kayak, designed by Wilderness Systems is made for fishermen looking for a self-propelled fishing kayak with maximum maneuverability and stability. This sit-on-top kayak weighs 79lbs and can hold a weight capacity of up to 500lbs. its propulsion is powered by paddle. This kayak features ‘AirPro Freedom Elite’ seating system which features a contoured seat and backrest specifically designed for comfort. The design incorporates multiple-sized holes in the special foam paddling which produce varying densities to deliver additional cushioning under the legs and along the spine and to comfortably support the buttocks. 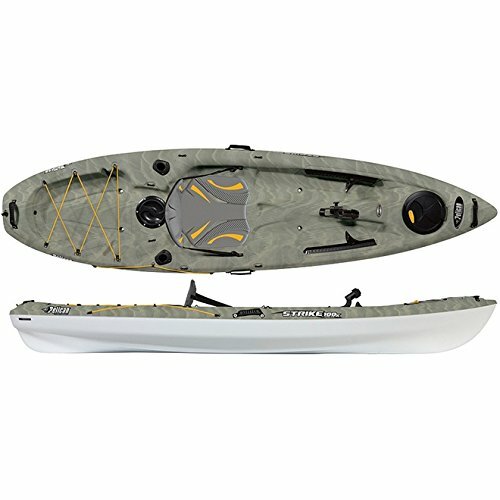 Notably, this kayak comes with removable electronics console to enable mounting of a fish finder and transducer and the battery is stored inside the console. When ready to transport or store the kayak, you can easily remove the console. The Ride115X also features a SlideTax equipment mounting rails that are installed on the stern, bow and under the console to make it easy for you to mount rod holders, safety flags and camera mounts. A flattened area has as well been provided on either gunwale to allow flush mounting of rod holders. The kayak also features lots of storage with an open tank well in the stern, and sealed hatches in the bow and amidships. Let us now highlight the pros and cons of this powerful kayak. A rudder system is available for this model. The center console may interfere with the standing room as you fish. If you are the discriminating fisherman, this is the kayak for you as it is easy to paddle. The kayak’s construction is done on a multichine flat bottom hull to provide this sit-on-top kayak a great level of stability. The kayak also has a decent tracking and maneuverability and ample storage space. The kayak comes in a sleek design and clean lines for speed. The Strike 100X Angler features adjustable footrests and the ERGOFIT G2 seating system, to provide you with that coveted comfort. The storage space comprises of a quick lock hatch, a storage platform with bungee cords for your gear and a 8” day hatch with a storage bag. The kayak comes with a swivel and flush rod holders and a paddle tie down. The kayak is indeed durable, because it is made of a multi-layer polyethylene known s RAM-XTM Premium. The material is significantly more rigid than standard polyethylene, stiffer, stronger and notably lighter. This kayak, comes with accessory eyelets and an angler ruler. This kayak weighs 50lbs(significantly light) and can hold a maximum capacity of up to 325lbs/147kg. Let us now look at the highlighted pros that will guarantee you memorable adventures in the waters and the parts we didn’t like much. The kayak boasts of a long life, thanks to its high-notch quality. The stability of this kayak is not much reliable on rough waters.